WARNING: This review does contain some spoilers. Read on at your own risk. 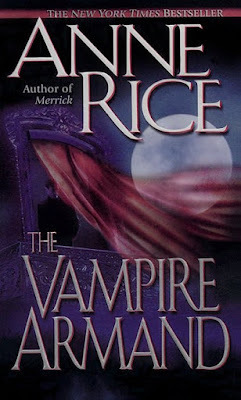 "In the latest installment of The Vampire Chronicles, Anne Rice summons up dazzling worlds to bring us the story of Armand - eternally young, with the face of a Botticelli angel......Now, we go with Armand across the centuries to the Kiev Rus of his boyhood - a ruined city under Mongol dominion - and to ancient Constantinople, where Tartar raiders sell him into slavery. And in a magnificent palazzo in the Venice of the Renaissance we see him emotionally and intellectually in thrall to the great vampire Marius, who masquerades among humankind as a mysterious, reclusive painter and who will bestow upon Armand the gift of vampiric blood. As the novel races to its climax, moving through scenes of luxury and elegance, of ambush, fire, and devil worship to nineteenth-century Paris and today's New Orleans, we see its eternally vulnerable and romantic hero forced to choose between his twilight immortality and the salvation of his immortal soul." THIS BOOK GUYS MY HEART. This is the sixth book in the Vampire Chronicles series and the first since the first one to be narrated by a character other than Lestat. Whereas Armand was a minor, "meh" sort of character before this, reading his life story as he narrates it in this book made me fall head over heals in love with him. The story was continually developing and the imagery Rice used beautiful throughout, and I really enjoyed reading it. Excellently done! I could perfectly picture every major setting - from Marius's home in Venice to the Russian Steppes to Sybelle and Benji's apartment. There was lots of variety, and everything was described with gorgeous clarity. The plot line actually turned out to be a lot different than I thought it would be - not bad, just different. Armand's life can be split into three main parts: his time with Marius in Venice, his 300-year time as a cult leader in Paris, and his life in the last century or so after the cult dissolved. In past books in the series, he's relayed details of his time in Paris to Louis, Lestat, and others, therefore most of that part of his life was explained already. As a result, a solid two-thirds of the book was spent on him and Marius in Venice (which I didn't mind, actually), his time in Paris was almost totally skipped over, and the last third focused most on explaining his apparent suicide at the end of the fifth book. This is where I must put a couple warnings - one, this book would be rather hard to read as a stand-alone, as it really assumes you've read other books in the series. You could get by fine with the bit of him in Venice, but in the last third you'd be totally lost, plus you wouldn't hear anything about 300 years of his life. Second - although TVA isn't a romance novel, there's a noticeable amount of erotica in the first two-thirds (being as he and Marius and Bianca were all lovers of a sort). So, if you're sensitive to that sort of thing, I wouldn't recommend this book. I actually ended up loving all the characters way more than I thought I would. Marius continued steady from the other books as a well-rounded, interesting character, and Armand was really fleshed out and became extremely likable. I fully expected to dislike Sybelle, Benji, and Bianca - I hate when new characters are introduced out-of-the-blue, and these three (especially Sybelle and Benji) definitely were. However, I grew to love them almost instantly. Sybelle and Bianca are incredibly sweet, yet practical and level-headed. Plus, Benji is ultra quirky and unique. A+++ on characters. 4.5 out of 5 stars. Definitely recommended to anyone who loves macabre/supernatural fiction and elegant writing - just make sure to look up a quick plot summary of the other books first so you understand what's going on. That book looks really good, I've been re reading the Septimus Heap/Magyk series which is probably one of my favorites. It is! Oh, I almost read that once, I think. So who knows what I'll read next. ME NEITHER OMG POOR BABY. Read Journey to the Center of the Earth or Gulliver's Travels; those are good ones.